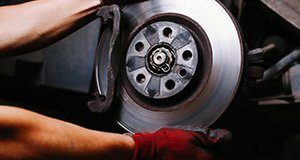 Flagship Ford offers new brakes and brake service near New Richmond, WI. We use genuine OEM replacement parts to make sure your vehicle stops like new. Our service technicians know your brake system inside and out, from the master cylinder to the anti-lock braking system sensors. Brake service can include brake pads, brake shoes, rotors, drums, master cylinders, hydraulic brake lines, calipers, wheel cylinders and brake hardware kits and we can special order any hard-to-find parts we do not have in stock. Visit our service center and check out our large selection of new brakes close to New Richmond, WI.